This month we will be celebrating the games of Visual Concepts, a western developer that is best known for the creation of the 2K Sports franchise of games. Not only did they have a long history battling EA on the Dreamcast; but they continue to battle against the EA Sports brand video games even after leaving our favorite publisher. What better month than July to focus on this largely overlooked and talented US-based development team. After the break, let’s look back at the games and history of Visual Concepts! If you have been taking notes in the last six months of our ‘Year of the Developers’ celebration, where we focus each month on the games of a single SEGA development team, most of the teams we have been covering have all been Japanese. Not only that, they have all been internally created teams at SEGA. Unlike those teams Visual Concepts had a history in gaming that spans as far back as creating games on MS-DOS and the team has always been based in America. Visual Concepts started creating video games on the Apple IIGS, having developed games like Task Force, Gnarly Golf and the Great Western Shootout; all of which where published by Britannica Software. The team wouldn’t really emerge into the mainstream until the 16-bit era where they got a chance to experiment with games like Lester the Unlikely, ClayFighter, Taz-Mania, and many more. While SEGA didn’t really have much ties with the team as a publisher, SEGA did have strong ties with EA and the Madden franchise (which Visual Concepts help develop with a in-house EA team). If you want to read about that, you can in my look back at EA not supporting the Dreamcast story I wrote awhile back. 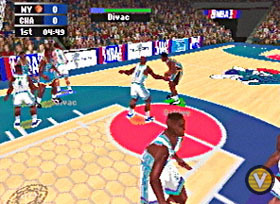 During the 32-bit era Visual Concepts mostly worked on sport games, even had NBA Action 98 published under the Sega Sports moniker. This impressed SEGA enough to first hire them to develop a brand new line of sport video games for their upcoming console at the time, the Dreamcast. 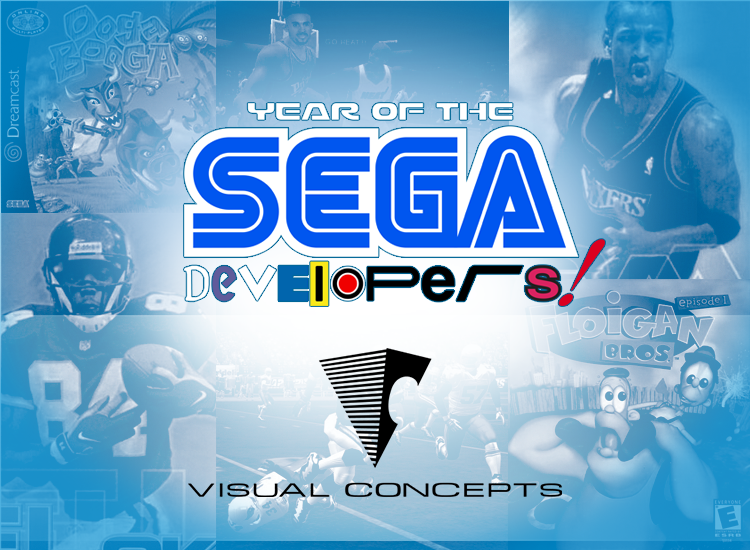 Shortly before the release of their debut sports games, SEGA purchased Visual Concepts on May 12th, 1999. Visual Concepts might be known for their contributions to reviving Sega Sports brand of games with its 2K series of games, but it also showed that it could do other games outside of sports which they showed with a few of their own titles. Not only did they have a large number of quality titles developed but they also helped other in-house Sega developers with their projects, for example they co-developed ToeJam & Earl III: Mission to Earth. Visual Concepts also helped do motion capture for other SEGA games like Sonic Adventure 2 and Sega Soccer Slam. Visual Concepts also did the college versions of their NFL and NBA licensed games but using college teams, but I decided to omit them due to the fact that they used the same innovations introduced via the bigger officially license products. I also didn’t include their Baseball games because they only did a few and weren’t well received. 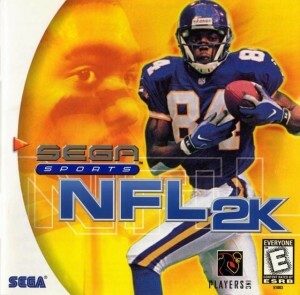 NFL 2K (1999): was the first game published by SEGA while owning Visual Concepts, also happens to be the first entry into their new 2K sports series of video games. The game was one of the many critically acclaimed Dreamcast launch titles in North America. While the game got a Japanese release a year later, NFL 2K never got a European release. The cover athlete for this (and the next two NFL 2K games) was Randy Moss from the Minnesota Vikings. The game introduced the franchises popular ‘Maxixmum Passing’ mechanic, allowing the players to lead receivers with their passes. The game was pretty fleshed out with modes including Tournament, Season, Fantasy Draft, Create-a-Player, Playoffs, Practice, and of course Exhibition. This was also one of the first sports games to have over 1,500 motion-captured moves and real physics-based 3D collisions. The game also took advantage of the VMU by using it to call plays. NBA 2K (1999): Just a few months after the release of the critically praised NFL 2K, Visual Concepts releases their NBA entry on Dreamcast with NBA 2K. 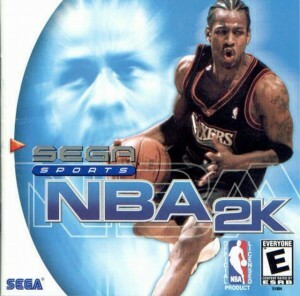 The game’s cover athlete for this game was Allen Iverson of the Philadelphia 76ers, he stayed on the cover of NBA 2K games until being replaced on ESPN NBA 2K5. Much like its NFL counterpart, NBA 2K wowed critics with its high quality graphics (for the time) and it even ran at a silky smooth 60fps, taking real advantage of what the Dreamcast hardware had to offer. The game also featured over 1,300 motion-captured moves and praised for setting a new standard in quality when it comes to basketball games. NFL 2K1 (2000): is a sequel to the first NFL 2K game. Coming out a year later the game had gameplay changes, graphical improvement, updatable rosters, and the much requested (and hyped for) online play. NFL 2K1 was the second Dreamcast game to support online play, barely being beaten by ChuChu Rocket. The game would allow players to communicate in-game via the Dreamcast keyboard. The online multiplayer allowed for 8 total players to play (4 on each console). NFL 2K1 would also feature a additional 2,000 motion-captured animations for game and a more realistic playbook. The game marked a big step in sports video games due to being the first NFL licensed game with online play and an online updatable roster. NBA 2K1 (2000): Much like NFL 2K1, NBA 2K1 also adds a in-depth franchise mode that wasn’t available in the first entry, which requires you to manage various aspects of your team while playing through season mode. The game also featured online multiplayer which was the 3rd game on the Dreamcast to support online play. The game also added famous street courts from around the globe, which allowed you to play either 5v5 or 2v2 matches. The game also licensed and featured tons of legendary NBA players from the 1950s all the way to the 1980s. Floigan Bros. Episode 1 (2001): Released late in the Dreamcast’s lifespan, Floigan Bros. was a unique release from Visual Concepts. Straying from the usual sports title, Visual Concepts had intended for Floigan Bros. to be the first in a series of episodic budget titles targeted at a younger audience – though really the game appealed to the inner child of players of all ages. The game starred brothers Hoigle and Moigle Floigan, who resembled Of Mice and Men‘s George and Lennie. 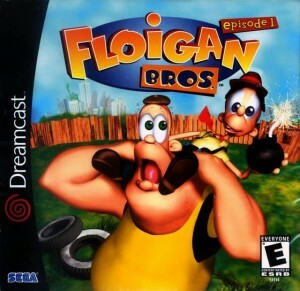 Thankfully, Floigan Bros. never went as dark as Steinbeck’s novel, instead taking place in a junkyard which is at risk of being taken over by a greedy baron. Players controlled small Hoigle who influenced and interacted with his larger brother Moigle to solve puzzles, battle evil cats, and save the day. Unfortunately, with SEGA’s transition to third party and the Dreamcast on the way out, Hoigle and Moigle Floigan never saw an Episode 2. Still, the original game remains a bright spot in the Dreamcast’s final months and no game has yet to match Floigan Bros. unique mix of gameplay. It is also worth noting that despite the simplistic graphics, Visual Concepts absolutely nailed Looney Tunes-style animation in a 3D game. 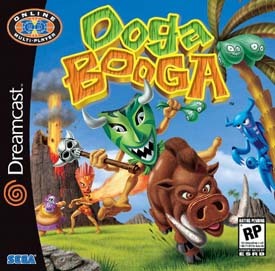 Ooga Booga (2001): Like Floigan Bros., Ooga Booga released late in the Dreamcast’s life and was very different from the developer’s other titles. Using a Polynesian setting, Visual Concepts crafted a wacky 1-4 player online battle game that was a welcome edition to the console’s online multi-player library, even if most players had moved on from the Dreamcast’s online service by the time the game released. While you can no longer play Ooga Booga online, the game remains a excellent local multi-player title featuring bright and cartoonishly animated graphics. NFL 2K2 (2001): This game was the last of the NFL 2K Sports games to be released on the SEGA Dreamcast and the first to be released on another console outside of the Dreamcast (getting a Xbox and Playstation 2 release). The game was released first on the Dreamcast and a few months later got a release on other platforms. The game introduced a new situation based animations and changed the way the run game was played. The entry also introduced online win/loss ratio score, a feature that wasn’t included in the previous version. While this entry made its debut on both Playstation 2 and Xbox systems, the Dreamcast version was considered the most full fledged at the time due to the fact that it was the only version that had online play, this happen due to the fact that Playstation 2 and Xbox’s online systems weren’t out at the time of the game’s release. 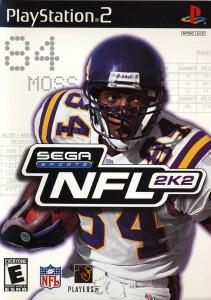 This is also the last time Randy Moss takes the cover for an NFL 2K game. NBA 2K2 (2001): Like NFL 2K2, this entry into the NBA 2K franchise is also the last to come out on the Dreamcast and the first one to be released on other consoles outside of the Dreamcast. 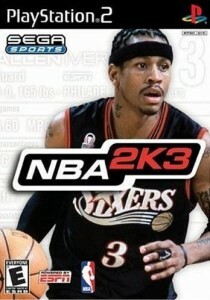 NBA 2K2 also got a release on Playstation 2, Xbox and Nintendo Gamecube. Much like its NFL big brother, NBA 2K2 was accepted as having its most complete release on the SEGA Dreamcast due to it being the only version with online competitive play. The game changed the way Fantasy Mode was played by not only allowing new comers to be put into a drafting pool, but every player including pros. The game also included even more street courts from across the United States, adding to an already impressive number that most competitor products couldn’t match at the time. 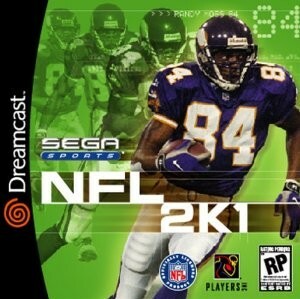 NFL 2K3 (2002): This marked the first NFL 2K entry not to appear on the SEGA Dreamcast. The game was released on the Xbox, Playstation 2 and Gamecube and garnered even more critical praise. SEGA still kept their SEGA Sports moniker for the game even if it wasn’t released on a SEGA console. Thanks to Sony releasing its Network Adapter and Microsoft debuting Xbox Live, this year’s entry featured online play on both consoles. Most critics agreed that while Madden also debuted its online play the same year, that Visual Concepts was leagues ahead in this area due to its head start with online play on the Dreamcast. The Gamecube version didn’t feature online play. The game also featured a new cover athlete, marking the first NFL 2K game not to feature Randy Moss on the cover. 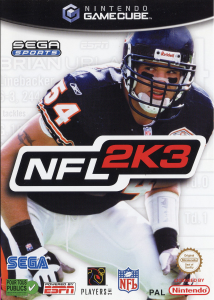 This time SEGA went with Brain Urlacher, a linebacker for the Chicago Bears. The game also introduced ‘SEGA Challenge mode’ which allowed users to rank themselves across the country. The feature would use a code system that the game gave you and had you input it on the game’s website. 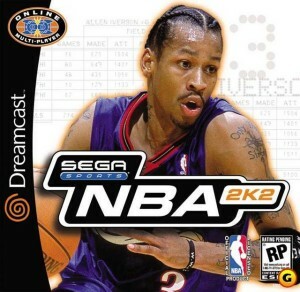 NBA 2K3 (2002): Much like NFL 2K3, this is the first NBA 2K game not to get a SEGA Dreamcast release. The game was released on Xbox, Gamecube and Playstation 2. This year’s entry not only debuted its NBA online play on Playstation 2 and Xbox, but it also took problems fans had with the previous entry and fixed them. For example NBA 2K2 had a problem with the computer AI having a shooting percentage of over 70% (considering a really good professional player has 60% shooting ratio), which they now balanced correctly. Stuff like weird angle shots acting up and wrong goal tending calls also got addressed. The game also introduced new features like allowing users to dive for loose balls, double crossover allowing the user to move past more than one defender and allowing the player to fight for their position (which wasn’t possible in the last entry). The game also has new passes including the chest high and bounce passes. The game was highly regarded for being one of the few basketball games at the time not trying to be arcade friendly and rather try to be semi-realistic. 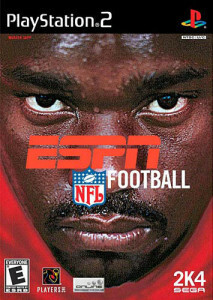 ESPN NFL Football (2003): SEGA showed that it really mean’t business when they went on to use the ESPN license to allow for a more realistic approach to the commentary and presentation inside the game. Another bizarre move, the game for this year was completely renamed from ‘NFL 2K4‘ to ESPN NFL Football. 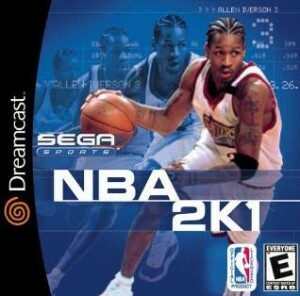 While ‘2K4 SEGA’ appeared on the right bottom hand corner of boxes in North America, SEGA for some reason decided not to use the 2K moniker in the title. This entry also introduced the ‘First Person Football Mode’ allowing you to play the game through the eyes of the player. The game also had more advanced AI that was harder to exploit but also featured a much better Franchise mode and improved graphics. The game’s cover athlete was Tampa Bay Buccaneer defensive tackle Warren Sapp. The game was notably delayed and came out after Madden, who came out with a improved product that included Owner Mode (to combat 2K’s franchise mode), but critics still praised the game and said the wait was worth it for fans. ESPN NBA Basketball (2003): Just like ESPN NFL Football, which released months prior to this title, the NBA 2K franchise was rebranded as ESPN NBA Basket for the year. The game was praised by critics as not only being one of the best looking basketball games on the market, but also being one of the best controlling games released by Visual Concepts thus far. This entry introduced ’24/7′ game mode that allows users to create a ‘baller’, build up their skills and take challenges across the various street basketball courts and against popular street players. The game also featured new IsoMotion controls which is like a system of Rock, Papers, Scissor between a defender and a ball carrier. Making the game more dynamic. 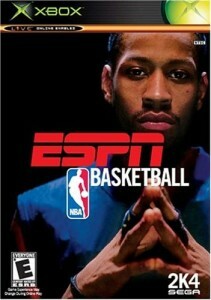 This would be the last game cover to feature NBA 2K cover athlete veteran Allen Iverson. ESPN NFL 2K5 (2004): The 2K moniker returns with this entry, which is considered one of the best Football game of all time by fans. Some even say the latest Madden entry (2015) is still not as good as a decade old NFL 2K5. This is also the first entry to be co-published by Take-Two, along with SEGA. The game was mostly known for starting the pricing war on NFL games by cutting the game’s price to $19.99 on the day of release. This forced Madden NFL 2005 to be reduced to $29.95. This is also the last 2K NFL game published by SEGA. The game brought all the past features including ESPN quality reporting with Franchise Mode using SportsCenter like presentation being hosted by Chris Berman and co-host Trey Wingo. The game also used features that would become a stable in future 2K sports titles like ‘Celebrity game’ where a ‘Celebrity’ (word is being used very loosely here) would call your ‘crib’ and challenge your team with one of their custom made teams. The calls included Jamie Kennedy, Steve-O, David Arquette, Funkmaster Flex and Carmen Electra. This marked the last official NFL licensed 2K sports game due to EA buying the exclusive rights to the NFL license. 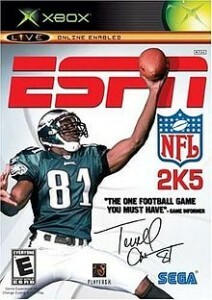 The cover athlete for the game was Terrell Owens of the Philadelphia Eagles. ESPN NBA 2K5 (2004): much like ESPN NFL 2K5, this game was also co-published by Take-Two (under Global Star Software) and SEGA. This is also the last NBA 2K sports to be published under the Japanese giant. The game focused mostly on improving the in-game physics. Past modes like 24/7, Street Basketball and Tournaments all make their return in this entry. One of the returning features that was reinvented for this year’s title was Franchise Mode that was now renamed: ‘The Association’ and a new version of Isomotion was introduced as well. Oddly enough it wasn’t critically praised compared to past titles, some critics even questioned the direction that Visual Concepts is taking the series. This actually turns out to be the lowest rated NBA 2K game listed on here, while still getting ‘great’ scores. The complaints come down to the presentation not being up to par with ESPN NFL 2K5, IsoMotion not evolving enough on defense and hiccups on framerate. Just like the ESPN NFL 2K5, this game was $19.99 on release date. 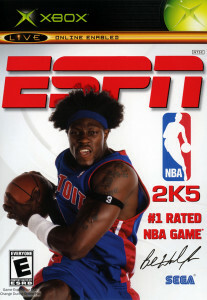 Replacing Allen Iverson as cover athlete is Detroit Pistons center Ben Wallace. Many people assumed that when SEGA announced it was co-publishing its 2K5 Sports entries with Take-Two, that it was only a matter of time that Take-Two would buy the franchise from SEGA and its internal sports studio Visual Concepts. It seemed that the sale was accelerated not only because EA bought the NFL license, but also because Take-Two secured 3rd party publishing rights to MLB licensed games. It seemed that SEGA was being hit from all sides and due to the NFL license being off the table, SEGA was forced to sell Visual Concepts and its 2K sports branding for a lower price than they would have otherwise. SEGA and Take-Two reached an agreement of $24 million dollars which granted them Visual Concepts and the ‘2K’ brand. Take-Two then created a subsidiary called ‘2K Games‘ that not only published 2K Sports games but also published games like Borderlands, Civilization V, The Darkness, and even the Bioshock series of games. While under control of Take-Two, Visual Concepts has grown to have teams in both China and Korea. While they haven’t had the chance to create a new NFL licensed game, they did try to make a non-licensed Football game with All-Pro Football 2K8, which featured retired players and fantasy teams. Reception for the game was considerably lower compared to past titles and another entry was never tried. Visual Concepts mostly focuses on its top selling and critically acclaimed NBA 2K franchise, which has dominated the NBA sports market. So much so that EA has been struggling to compete with its NBA Live games. This is the thing we needed so much here.